This article was published in DNE on 2 November 2016. As calls for protests garner more attention from the media and citizens who have long ignored them, many serious questions about Egypt's trajectory arise. This is perhaps Egypt's most disheartening moment in recent history. Besides the unprecedented scale of human rights abuses, it is obvious to dwellers and onlookers that Egypt's economy is swiftly spiraling towards collapse. The leadership is struggling to keep its head above water, as the long sought after hope of political stability turns frail. What makes the moment more tragic is not the absence of hope but its fleeting presence. Egypt's path to recovery has long been clear. Yet, the economic interests of the policy makers have stalled any political will to execute them. Economic figures aside, future prospects are primarily based on trust. 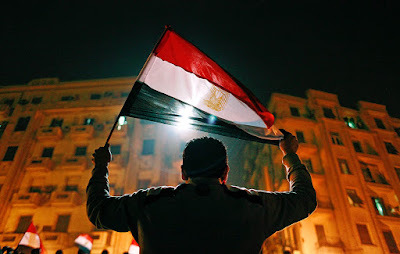 As conditions worsen and the interests of the political elite become clearer to the average citizen, trust in Egypt's present leadership withers. Egypt's economic ills are but symptoms of its political ailments, and they require urgent redress. Egypt needs direct political reforms to establish a system capable of executing long-term plans beneficial to the country's future. At the moment, the majority of decisions are taken by non-elected officials belonging to one security apparatus or another. They have three major motivations: narrow individual interests, securing the present regime, and a revenge agenda against Islamist or secular opposition. Their decisions are not subject to oversight. The parliament's handpicked members are more a representation of security agencies than of the people. Similarly, the entire political system lacks cheques and balances. There is no manner to challenge decision makers without paying a heavy price. Egypt's top auditor, Hesham Geneina, was removed from his post after releasing statements about his report's findings that indicated mass corruption. In theory, that ought to have triggered an investigation into the government bodies accused of financial violations, but the opposite happened and Geneina was referred to trial. The absence of balances has also corrupted the market in Egypt. While the army's role in the economy has long been established, the army is now, more than ever, directly involved in policy. This means that generals control the army's share of contracts and the shares of non-military owned companies in the market. Hence, it is not just the army's economic empire that affects the market, but rather the complete hegemony over economic and business policies. Many civilian companies are subcontracted by the army, but they have no means to litigate against the army if they are extorted in some way or another or their payments delayed. When the army does business, it does not pay taxes; it utilises poorly paid conscripts, and its budget is not subject to parliamentary oversight. Even if the army produces goods or delivers construction projects at a lower cost, there's no way to ensure that profits made are pumped back into the economy. Money is taken out of the monetary cycle. Private businesses have to compete with military industries that do not have to pay labour, taxes, customs, and transportation, and have no difficulty finding foreign currency to conclude their deals with partners abroad. This arrangement certainly doesn't consider long-term, economic growth. Egypt's hope lies in the ability to challenge political, economic, and social policies. Egypt must prioritise the country's interests rather than a few individuals who enjoy impunity or corrupt rewards. To find hope, trust in the process and leadership must be restored. Opportunities must be afforded to clever, competent decision makers. In actionable, concrete terms, hope lies in a parliament comprised of fairly elected representatives of the people willing to challenge the government, in the immediate release of all political prisoners (estimated to be in the tens of thousands), in repealing the flawed Protest Law, in ending the targeting of civil society so that it is vibrant and able to call out abuse of power, and in abiding by the Constitution to call into account all extrajudicial decisions and actions taken by state officials. These steps are where hope lies in the short term to instill trust, and in order to stand a chance, there's more. The army must gradually distance itself from its hegemonic role in the economy and allow for businesses to operate within a fair and healthy market. There must also be a commitment from the government to end brutal police practices and devise an organisational restructure with meaningful oversight. The judiciary must end punitive rulings that serve the regime. Egypt's youth, its most important resource and symbol for its future, are targeted instead of embraced. Many are defamed, imprisoned, disappeared, and sidelined. Instead of engaging with youth, the regime opted for a flashy youth conference held in Sharm El-Sheikh. The conference was insulting to many as it attempts to window dress systematic abuses against Egyptian youth each day. A more realistic youth conference would have been held in jails where many politically enlightened youth are being held. At this more legitimate youth conference, we would have witnessed Egypt's forcibly disappeared youth reappear and go home with their families. Empty rhetoric and obstinacy is the regime's alternative to meaningful change. False promises for a better future only entrench Egypt deeper into its failing trajectory. Egypt's hope lies in investing in youth and accountability; hopes that Egypt's trajectory miraculously changes without real reforms are lies.